We're midway through the week and I thought I'd share with you this gorgeous watercolor flower spray card. I love paper flowers! Especially the very dimensional ones. They're absolutely gorgeous but can set you back more than a few dollars and usually the large blooms only come 2 per pack! Not very pocketbook friendly. 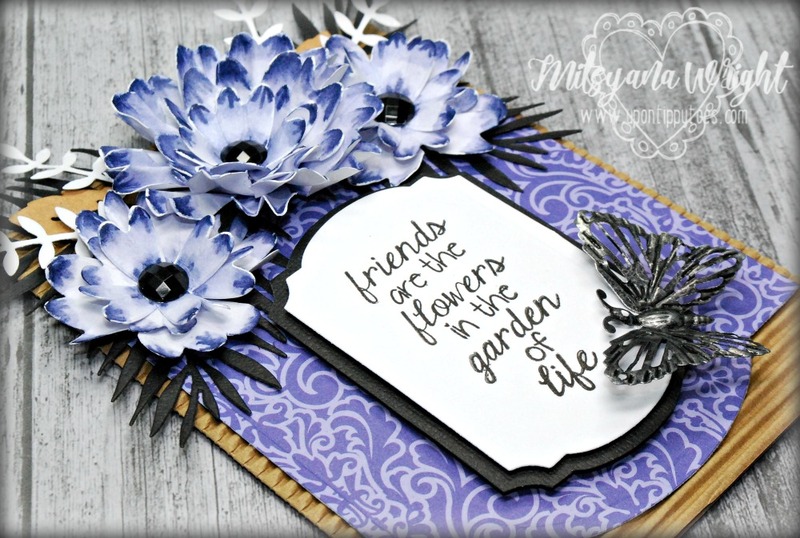 So, today I'll show you how you can make your own big gorgeous blooms by using Eileen Hull's Flower Layers Die w/ Heart Petals Die! 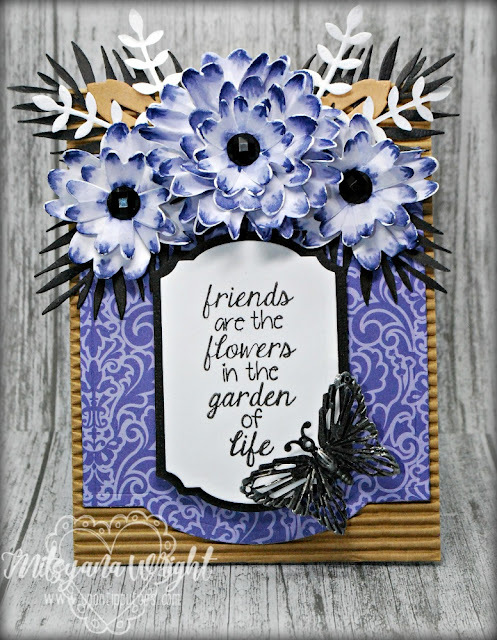 I started by first cutting multiple flowers from white cardstock using Eileen's Flower Layer die. Then stacked them together and made a cut toward the center hole (about a 1/4" away from the hole). Using a water brush I blended out the color across the petal and down toward the centers. While the petals are still damp from watercoloring them, I folded creases into each petal. I sped up the drying time and made the creases firm and permanent by drying them with a heat tool . For the "finished" large flower, I used 2 large, 1 medium, and 2 small flowers. For the smaller flowers, I used 1 medium and two small flowers. 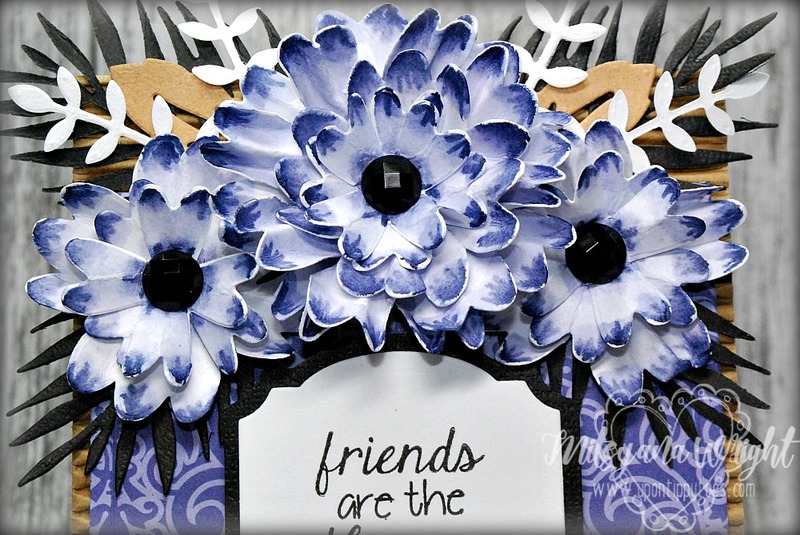 I layered the flowers together and and adhered together using a clear liquid adhesive. 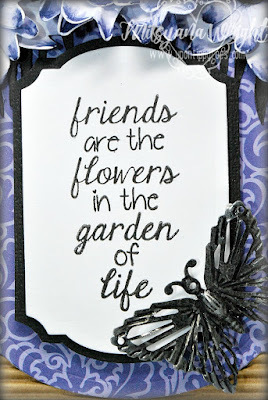 Then added self adhesive black rhinestones for the centers of each flower. I wanted my cardbase to be this corrugated card. I love the natural brown of the corrugate and the funky texture it adds. But because If all the added texture, I needed some pretty heavy duty adhesive. Using liquid glue would've seeped through the groove, so instead I used my Creative Station Lite to attach my background paper onto the corrugate paper. Once down, I used a light touch of clear liquid adhesive to attach the leaves, branches, and stems. Then added the blooms over the layered leaves. 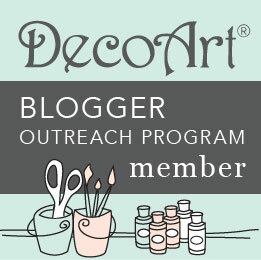 I stamped my sentiment in black ink and onto labels that I popped up with foam adhesive. Then attached it onto my card front. Then, I attached a metal butterfly in the lower right hand corner. 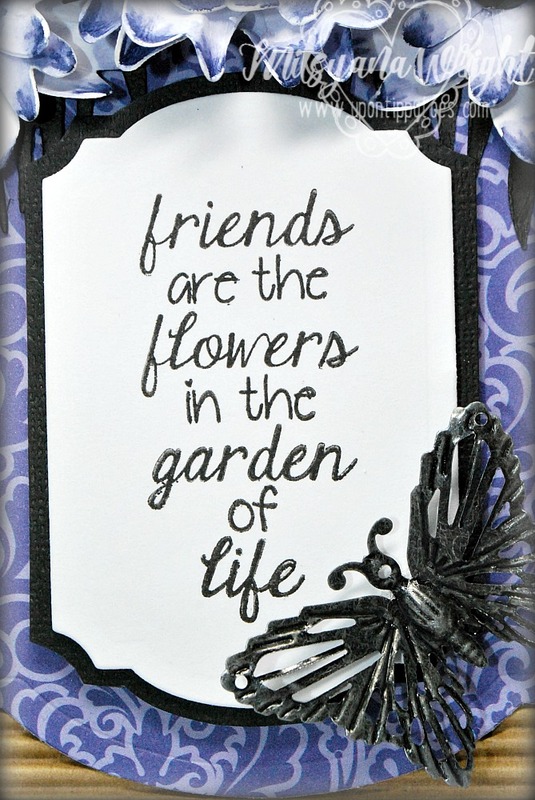 Awww, this is such a sweet sentiment! Every garden need butterflies, right?!! You can really see how much dimension and texture there is in this card! I really hope this project has inspired you to build and create your own paper flowers! They are so much fun to make!! And the results... Stunning! !